Saree or sari is the traditional wear in South Asia especially in India. It has different ways of wearing style that depends upon the state, region and community. The sari is the most elegant and beautiful wear. It can be worn for different occasions, in different ways to give you a different look each time. Saree is always worn with Blouse. Here is the tutorial for the Saree Blouse. 1/5 chest for up to 30” chest measurement. ¼ chest – 1/15 chest for 30” to 35.5” of chest measurement. 1/6 chest for 35.5” and above chest measurement. (6-5’) = shoulder is pushed in by 2cms for low neck measurements. Diagonal line for a normal figure & curved line for a heavier figure. Dart length (17-12) should be approximately 6cms. 18 is 1.5cms from 11. (3-20) = 1/12 of chest 0.5cm on either sides of 20. 21 is 3cms from 17. (2-A) = (6’-B) = 1/3of (6-6’). (A-B) = ½across front. 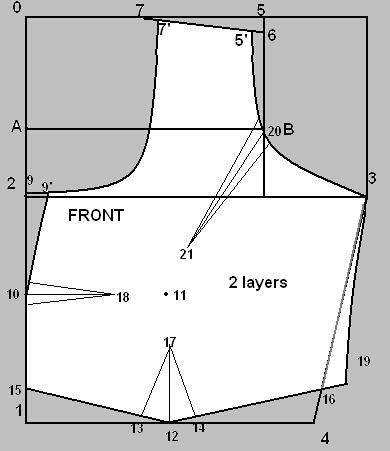 Shape 5’-B-3 front armhole curve. Measure 5’-B-3 it should be more than actual armhole by 1cm. 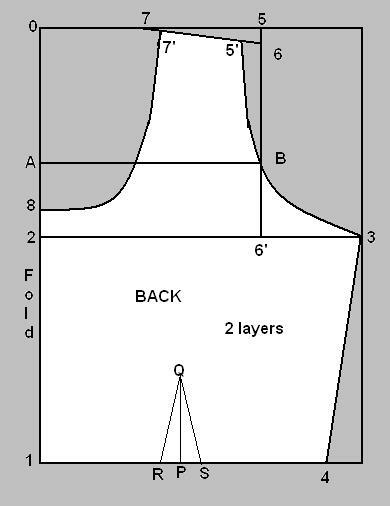 5’-B-3 front armhole curve is a deeper curve than the back armhole curve. Measure (15-12) and mark the same as (12-19). If (15-12) is 4” means mark (12-19) 4”. (1-2) can be taken on fold. 1cm at waist band and Centre Front. 2 Straight pieces for hook strips and Bias (cross pieces) for neckline has to be cut with appropriate measurements. First 2 small darts have to stitch at the back part straight to the shoulders. Then the main three darts have to be stitched carefully in the front part. The dart stitched at the bottom should be bigger that the 2 darts at the left and right sides. The Waist band part has to be stitched after stitching the three main darts, the front part has to be stitched to the Waistband part. After attaching the Waist band to front part the length is equals to the back part. Turn the front pieces wrong side out and sew along the hemlines (separately) with 1cm seam allowance. Turn right side out and press. Now have to attach the straight pieces to make the hook straps at the either side of front opening. Time to attach shoulders of front and back parts correctly. Sleeves have to be added with blouse. First finish the hemline of sleeves and attach the left and right sleeves to the blouse. Now attach the side seams using 2cms seam allowance. Stitch has to start from the hemline of sleeve and ends with the hem line of blouse. The neckline has to be fished with bias (cross piece) piece. Attach hook and lock on an either hook strips at front opening. I love sewing and really your website is more helpful for the begginer.. 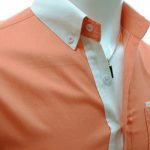 I have a request, If possible, please post Men’s shirt pattern. (how to draw the pattern ) Step by step.. Its more helpful for me and the followers. Thanks for your comment Harini… Men’s shirt tutorial should be in my future tutorial… Thanks to remind..
Hi.. Anitha.. 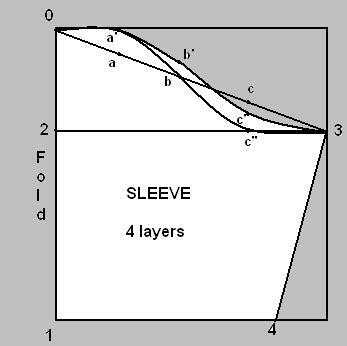 Thanks for or comment..this will helpful for readers..
For armhole adjustment u should move the line(2-3) towards up for tight fit.. u should compare the measurement with ur old blouse while drafting because some time measurements are depends upon the person.. I had only one prob in armhole round.plz help panunga..perfect arm hole ku 44” body ku evalavu inch arm hole edhukanum madam plz help me……. hello hi madam ,i am s.anitha from padi .i want some tips for blouse and chudi .bcoz i have two daughters . i am interesting in tailoring so give tips and more videos send mail id mam. Hi keerthi mam, v.useful for ur explained.then I want how to stitch the Saree blouse step by step includes the final finishing step.please send the videos its v.useful for me and the follow ers.thank u mam.ple reply. hi.. devi…I’ll try to make videos in future… Happy sewing..
Hi Keerthi, do you have any video clips on how to sew this blouse. Very useful information. Tutorials help me to cut blouse . Hi Keerthi please the measurements are given inches or cm. thanks. hi.. Rani… now i’m preparing some other tutorials.. so.. that could be our future one.. thank u.. happy sewing..
Hi mam!can u draw the picture for stitching chudithar!!!! It’s a good website for womens. I also don’t understand the across back measurement (6′-B” = 1/2 across back. Would you be able to give an image on how you take measurements that tallies to your requirement? Hi i have a wrkshop of designer wear of women, you change my mind today there is lots of waste material in my shop, we throw all but now today onwards i m going to create new things from the waste. Also i m totally dependant into my masterji but i m promiseing my self to start my learning again for better way . Good to see your comment… all the best for ur new ideas.. Happy sewing..
Hi Madam, I liked your tutorial. Method is simple and easy to understand for learners. I am interested in stitching blouses and kurtis for my daughters. Can you also throw some light on cutting and stitching of simple anarkali kurtis. Thank you. only in some places we have to use Cms because of the perfect fit. Good explanation. Do you offer online class? I learnt tailoring long time ago. Now I want to refresh the stitching knowledge and also would like to learn some new skills. Pls. email me at seebha2010@gmail.com. Thanks. No..dear.. i use this same construction for my own..
Madam, very useful tutorial. Mam i would like to meet you is you are in chennai. I am interested in learning machine embroidery. Any body can come home and teach me. What machine is suitable for it. I am residing in adyar. Hi Ezhil, your tutorial is very usefull, but i still don’t understand 6′ – B please give more detailed information or What could be the approximate value for this? Hi the chest line (2-3) is marked this is full bust measurement. This coincides with the end of arm syce. Where as in reality the full bust is not where the arm syce ends. The full bust can be lower, so in this case won’t there be excess fabric under arm ? How do you draft for this case please suggest. Also thanks for sharing so many nice tutorials on your blog. hai keerthi madam, i was saw this website for my mother. she is stiching 10 years. but she does’nt knows a normal blouse measurements. but now this website helps in many way thankyou madam for your kind social helps. hi spandan.. if u go with deep neck u should reduce your neck width by 1/4″ to 1/2″ to avoid widen shoulders. Madam idhai appadiye tamilil tharamudiyuma ,pls yennaippol ullavargalukku help a irukkum. Hi…I am a starter and i really want to learn to stitch a blouse. Is it possible to do so by following the steps you have said about on your website? Can you give me some tips to learn to stitch properly? Excellent. My size 32. Can you suggest cutting pattern with measurements. Please send me bouse pattern for 40 and 42. Hey Kirthi,, Can you tell the average meter required for a sari blouse… a blouse with elbow sleeve and boat neck in the front and back.. I mean. Will 0.80 meter be sufficient? Very clear instruction for beginners. Very good blog. Hi Keerti, Really very nice. உங்கள் பதிவுகள் ஒவ்வொன்றும் மிக அருமையாக உள்ளது. மிக பெருந்தன்மையாக செயற்படுகின்றீர்கள். உங்களை நேர்காணல் செய்ய விரும்புகிறேன் அனுமதி கிடைக்குமா…? Your information is very useful. Thank you so much. In armhole dart explanation u mentioned 6′ but in the drafting u didn’t mention 6′ in the front drafting. . Please use bracket for additional and division. .. It is very useful to know stitching.thank you. I like ur tips mam.thank you so much. Hi Keerthi, what is ACROSS BACK and ACROSS FRONT in measurements? How to calculate that? I am little confuse here. there is one more , how to take top sleeve measurements? Tried making pattern using above method. 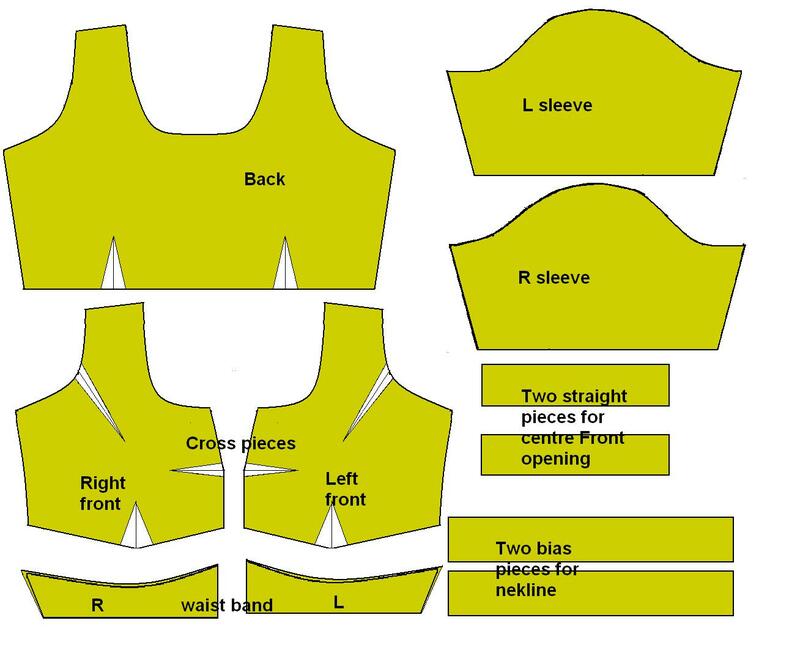 In blouse measurements you’ve mentioned point length or 1/2 chest and in front pattern you’ve mentioned point length or 1/4 chest. Also please tell how to measure point length?. Are you using this pattern to teach your students. 5 – 6′ measures 8.5 inches but 6′ to B measures 18. How did you get this. Please don’t teach like this. I dont understand wat is the measurement (6-5’) = 1/2 across back…wat is 1/2 across back? (6’-B) = ½ across back. 1. Can I take (6′ – B) in Back part pattern same as (6′ – B) of Front part pattern. 2. can I consider Across back or Across front = shoulder length.